A more beautiful lily there has never been. For lovers of garlic, this certainly holds true. The subtle garlic flavor of Garlic Chives is perfect for use in uncooked dishes where raw regular garlic might be overwhelming or too spicy. This Asian beauty is sometimes called Perennial Chinese Chives or Chinese leeks or even just leek. While not the true leek, this is probably a reference to their blades which resemble little leek leaves. 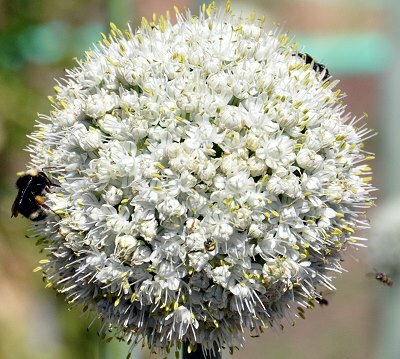 Garlic Chive flowers, which are also edible, bloom in the warmth of summer, which is in contrast to the early spring flowers of regular Chives. Let a few flower heads go to seed and ripen. The shiny black seeds are a peppery delicacy when sprouted: the perfect winter treat. 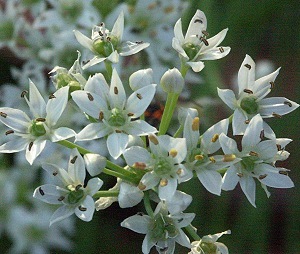 When they are in full bloom the beneficial insects and bees flock to the pure white nectar rich Garlic Chive flowers. As you can see here, Garlic Chives have a flat blade. Regular Chives, on the other hand, have hollow spears. Both are great tasting and easy to grow and can be used interchangeably in recipes. The finely chopped blades are great added to stir-frys and egg dishes. Garlic Chives do make a very small bulb that can be used like a small green onion. Harvest bulbs while the flower is still a bud. Be sure to leave some of the bulbs in the ground so the plant can continue to grow. Harvest blades by cutting all the way to the ground. This allows new foliage to be free of grassy half blades that have been left behind to turn brown on the tips. Garlic Chives are sometimes grown blanched, or without light, to produce white blades, similar to white asparagus. Like all plants, Garlic Chives prefer fertile ground. Divide every few years when production seems to slow. For recipes and more information on garlic chives, please visit our pinterest board here. 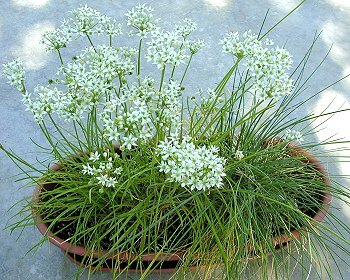 Garlic Chives are one of the six plants included in our Gourmet Herb Garden Six Pack. They also make a great addition to our Small Space Herb Garden Six Pack and our Edible Flower Garden Six Pack. This plant is often available in plug trays. These trays hold 128 of all the same plant. They are a great low cost way to fill a lot of space. Each cell is 3/4 of inch by an inch. Check here to see if Garlic Chive Plug Trays are available.